This assessment follows up on the randomized control trial conducted in 2014-2015 with Village Reach, PATH, and the Ministry of Health in Mozambique which aimed to evaluate the impact of remote temperature monitoring (RTM) on vaccine cold chain equipment performance at the health facility level. That study showed that RTM with SMS alerts increased fridge uptime and reduced freezing, as compared to 30 day temperature loggers and paper charts. (See Appendix I of the report for more details.) However, even some fridges in the RTM experimental group had chronic problems and failed to achieve 95% uptime. We launched this follow-up investigation to answer the question: Can maintenance + RTM lead to 95% uptime? A cold chain expert traveled to Mozambique from September 24 until October 14, 2015. He used ColdTrace data to identify 27 fridges that were failing and worked with the Ministry of Health maintenance technician to visit or remotely diagnose and fix as many fridges as possible. The expert remained active in fridge fixes, phone calls and follow-ups through the end of November 2015. 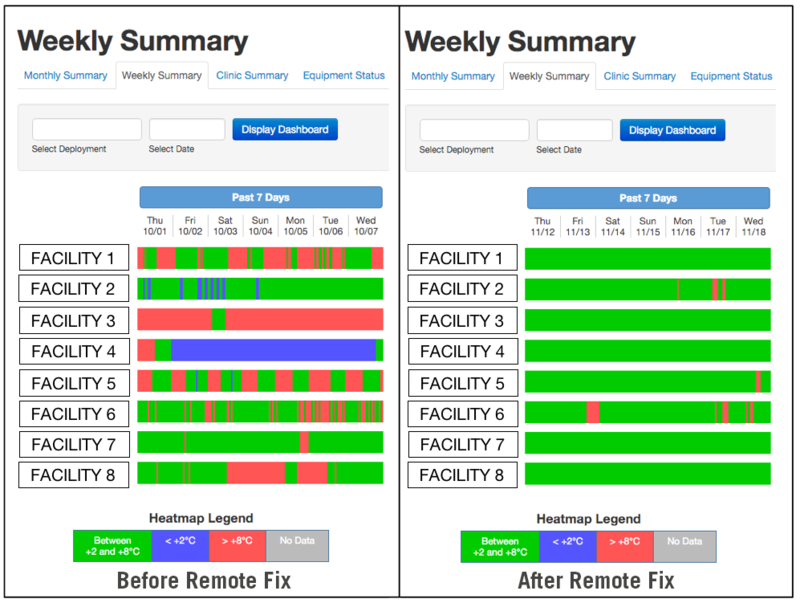 Perhaps the most interesting finding was that distinct patterns in the RTM data (which we call “temperature data signatures”) can be used to remotely diagnose problems and enable remote fixes via phone calls to nurses in clinics. For the improperly adjusted fridges in this investigation, thermostat adjustments increased uptime by 30%. Today, the MOH technician continues to use the dashboard data to diagnose problems, call clinics to address the issues, and verify fixes by monitoring subsequent temperature data. We also learned that, without access to key spare parts/tools, even an expert technician cannot get all fridges to 95%: flat batteries on solar fridges were one such problem that the expert did not have the resources to fix. With RTM data, however, those responsible for cold chain maintenance can identify which fridges need help and determine where to focus resources.